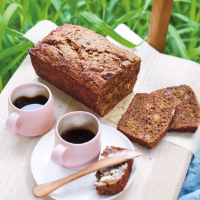 Using courgette in this tasty tea bread makes it wonderfully moist. 1. Preheat the oven to 180°C, gas mark 4. Grease and line the base and sides of a small loaf tin with a capacity of 750ml. 2. Put the tea bags in a large mixing bowl with 200ml boiling water and leave for 5 minutes. Squeeze out and discard the tea bags. 3. Add the sultanas, sugar, mint and cereal to the bowl and stir to mix. Leave to stand for 15 minutes until the cereal is soft. 4. Stir in the courgette, flour and baking powder and transfer to the tin. Bake for about 50–60 minutes or until firm to the touch and a skewer inserted into the centre comes out clean. Transfer to a wire rack to cool. Serve sliced, with butter.